Latest updated version of this product as of Sept. 2012. Foam-safe glue bonds Depron, EPS, EPP, XPS, EPO, and many other types of foam as well as carbon fiber and wood. 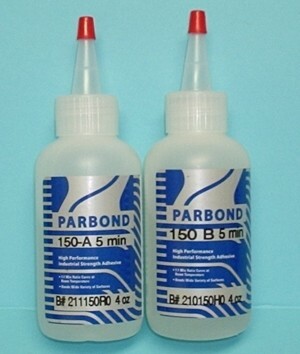 Excellent for building or repairing RC planes. Does not attack, melt or dissolve foams but holds quickly and cleanly. Remains flexible and clear once dry, never brittle. Super strong bond is like welding the foam together. Requires much less glue for a permanent bond than a cyanoacrylate- based glue. Won't glue fingers together. ALWAYS test on scrap materials first to ensure compatibility. Surfaces must be clean, dry, and free of dust and grease. Spread glue evenly on both sides of material to be bonded. Allow surfaces to air dry for 10-20 minutes depending upon size of area being glued. Maximum bond is achieved within 24 hours or less. Always replace the flat white cap after each use to prevent product evaporation. Do not use near any open flame or ignition source. Avoid prolonged breather of vapors. Keep out of reach of children. This is a clear contact style adhesive. Apply glue to part, touch parts together several times making glue strings/webs if you can. Press parts firnly together. Flying strength is acheived in most. Most joints (depending on size) are flyable in 10 to 20 minutes. Strength of joint continues to improve for 24 hours. High Quality 5 Minute Epoxy. Use epoxy where a strong non-brittle bond is required. Firewalls, landing gear blocks, wing hold down bolt blocks, fuel proofing and on sensitive materials like foam. 5 minute epoxy is best for quick repairs and new model construction where lots of working time is not required. Hint! If you mix your epoxy on a flexible surface, like a paper plate you can go back to the mixture a week later and flex it. If it cracks easily then your not getting the portions mixed properly or failing to mix them enough. A good epoxy joint is very strong yet somewhat flexible. If the puddle of glue cracks it means it is hard like glass and not giving you the best qualities of the glue. Using a paper plate flex test is a good way to follow your own progress and improve your glue mixing skills. Note: Two, 2oz. bottles shown, but you get two 4oz. bottles in this size (4 oz. part A and 4 oz. part B = 8 total oz. of 5 min. epoxy). High Quality 30 Minute Epoxy. Use epoxy where a strong non-brittle bond is required. Firewalls, landing gear blocks, wing hold down bolt blocks, fuel proofing and on sensitive materials like foam. 30 minute epoxy is best for quick repairs and new model construction where lots of working time is required. Also excellent for wetting out small fiber glass sections. Hint! Need your joint to cure a little faster? Take a covering heat shrink gun to the joint and warm it up. Be carefull, the heat will at first cause the epoxy to become thinner, it might run out of the joint and make a mess. Also, be warned! A little heat goes a long way and can cause your glue to dry faster than you had planned. You can also preheat the glue before applying to the parts or pre heat the parts. All purpose 5 minute epoxy in resealable 1 oz. applicator. 5 minute working time, 15 minutes hard. Easy flow syringe with snap open cap. Reseals for storage. Foam Compatible, low odor and lower to medium viscosity cyanoacrylate that provides a "low bloom" cure on plastics and other materials. USEFUL HINTS/NOTES: When using with foam spritz the activator in the air and waft the foam part through the mist. It is recommended only very light applications of accelerator be used. Just a micro dusting of accelerator is all that is needed. 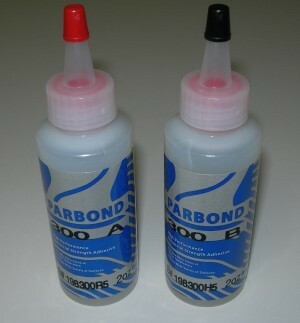 Note, CA adhesives keep a long time in the fridge or freezer. Just be sure to get the glue out an hour or two before you need to open it so it comes up to room temp fully. Buy extra now and lock up the savings. DESCRIPTION: Mercury MH16 is a General Activator accellerator. It is ozone friendly and used for normal curing of cyanoacrylates, depositing a correct balance of neutralizing ions on the surface, stimulating attrition for the adhesive and preparing the surface for bonding. Useful Hints: Mercury MH16 can be used to speed cure by brushing or spraying onto the surface, applying drop wise, the superglue and then over spraying to cure fillets such as on wire tacking jobs. Works best under repeated applications rather than one excessively large application. Useful Hints Foam: When any accelerator is used with foams, it should be misted into the air and one part waved through the mist. Spraying directly onto foam may cause adhesives to cure too quickly with the resulting heat damaging the foam. Although this is our favorite accelerator for foam, it is always reccomended that you test any adhesive or accelerator on a scrap before using on your model. Incompatibilitys may exist that we are not aware of. Popular contact adhesive for EPP foamy construction. 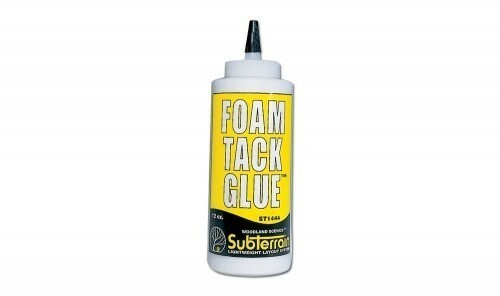 Listed with other foam adhesives, however may melt other types of foams. Test on scraps first! Welder is a clear, industrial strength all-purpose CONTACT ADHESIVE that bonds porous and non-porous materials together in both outdoor and indoor applications. Welder can be used on plastic, wood, metal, rubber, vinyl, cloth, tile, ceramic, glass, Formica and others, but is particularly effective for attaching refrigerator gasket materials to plastic or fiberglass surfaces. Multipurpose Adhesive can be used on nearly any material. Primarily formulated to bond Styrofoam to Styrofoam or other materials. Won't melt any foams. Is a contact adhesive. Spray one or both surfaces then squeeze together. Tack Range: One surface 1-5 minutes, two surfaces 2-15 minutes. Vapors extremely flammable. Do not Inhale. Keep from children. NOTE: Any order containing this product will be marked ORM-D and will come to you by surface "Parcel Post" only. This item may only be shipped within the USA, no international orders accepted. Sorry, sold out, temporarily out of stock. Odorless, equal-mix, Cures in 6 to 8 hours. Easy sanding. 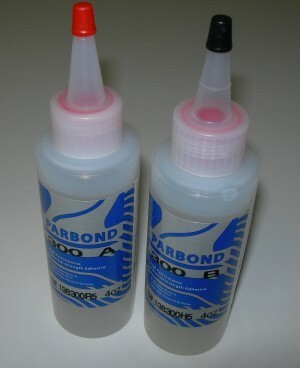 Perfect epoxy for applying glass cloth to your models and sheeting wings. 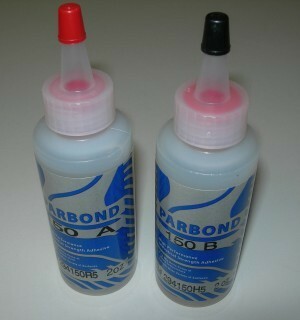 Compatible with many polyester resins. Finishing resins are thinner than the assembly epoxy's your used to. Designed to wet out glass cloth and spread easily. Can also be used to wet out and apply other finishes such as papers and cloths. Unlike many fishing resins that require a scale to mix unequal parts properly, Z-POXY is made with equal mixtures of both parts.